A portrait of a popular fictional political commentator of the 1830s, created by Seba Smith who wrote humorous essays and letters under his name. 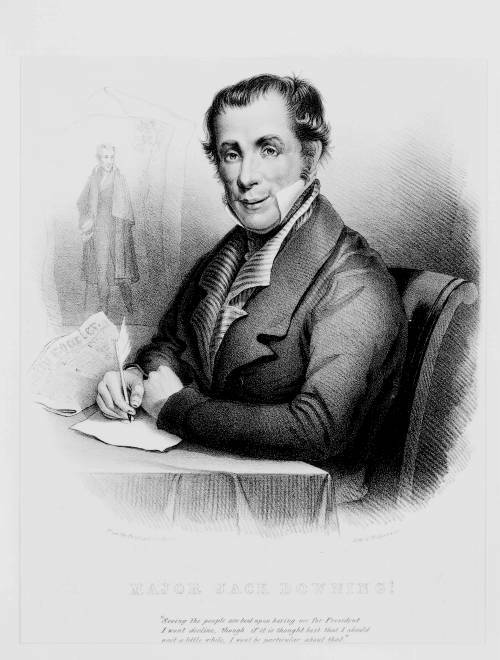 Smith's book "The Life and Writings of Major Jack Downing of Downingville" was first published in 1833 in Boston. The print shows Downing seated writing at a table, with a copy of the "Daily Courier" by his arm. A portrait of Andrew Jackson hangs on the wall behind him. The Library's impression of the print was deposited for copyright on December 2, 1833 by the artist Joseph T. Harris.